This level has medium difficulty. 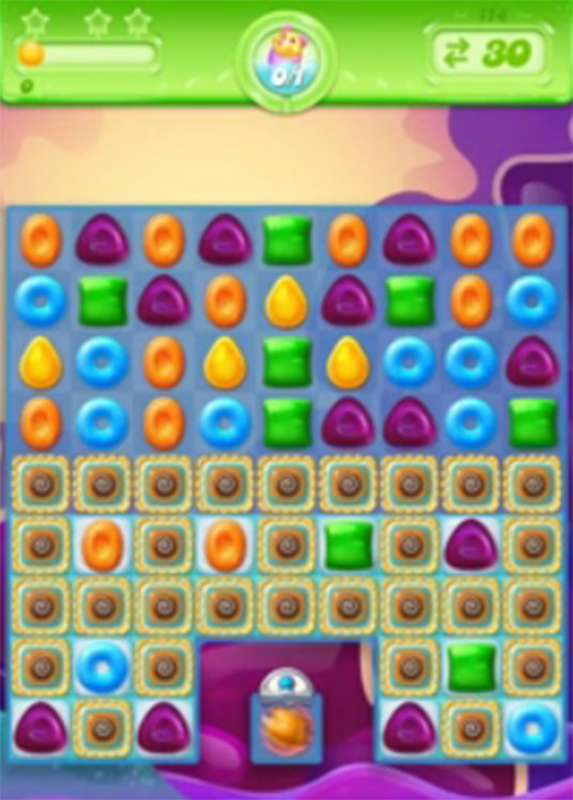 For this level try to play more more from the bottom to break the blockers and make special candy by combining more same color candies. Combine special candies with each other to break more frosting blockers to find the pufflers. Medium difficulty is understating this level. I tried hundreds of times and it just doesn’t finish. The moment you start getting the puffler it escapes to a corner. Plus it’s very long so chances are even with a chain reaction you can’t get it all with a single move, after which it escapes. Also they give you 25 moves not 30 as stated above. King are intentionally making near impossible levels in Jelly more than other games. Wait, I only get 22 moves as well! I only have 25 moves and starts with only 3 rows on top that are open, not 4.. why is this. Its near impossible to finish. My screen is the same Christine! I only have 3 rows and 25 moves. This board is extremely frustrating!!! I have tried at least a hundred times and haven’t gotten close morenthan 2 or 3 times. I’ve looked everywhere to no avail! really? That’s happened to me in other games. I wonder if you uninstalled it then started again, to see if it changes. I seems to me it’s all about the board you’re given from the start. I haven’t encountered a board set up like the example. I do get deceit set ups but, still run out of moves. I do not understand why some have 30 moves and 4 rows and we have 25 and 3, this level is impossible, I have been stuck for a week, and even if I have a good game with tons of power moves, I can’t win. 25 moves is not enough…I’m emailing King, because this is crap. I just watched a walk through where they had 35 moves! Not fair! I am having the same issues. This game pretty much su**. Time to find another one rather then wasting my time on crap you can’t beat! Why do you say 30 moves when they only give you 25. That’s not even enough and refuse to buy stuff to win. Not a fun game at all. Candy soda is much better. It doesn’t matter how hard I try, I NEVER get all those pueple candies in the combinations shown above. This game is fixed and geared towards people who are willing to pay money for power ups and extra moves. I’m not sure how this player in the video did it….I run out of moves fast and never get enough special candies. I have the same problem. 22 moves, 3 rows on top. Been stuck on this level for 2 weeks. I have 5 rows and get 22 moves. This is insanely ridiculous. I’m on an iPad and I only get 22 moves for this level. Been stuck on it for a week now. Ok really? When I play I only have 22 moves and 3 rows to start. I don’t have any boosters to help. The person in this video is insanely lucky to have the purple candies land and match the way they did. I’ve never had that happen to me on this level that many times. I’ve been stuck in this leave for like 3 weeks. I get close sometimes but it’s impossible. Has anyone contacted support? King.com? The idea is to get you frustrated enough to spend money on boosters after all this what the game is really about … they have been soft on you I think they thought it is time they get tough ? Maybe in the good old days you got 30 moves. I get 22. It is simply impossible. I’m seriously considering just uninstalling as it is pointless.